The small town of Annot is situated in the Alpes de Haute Provence district of southern France, close to the infamous Verdon river. It is about an hour’s drive north from Nice (80 km) or around 2-3 hours from Marseille (200 km). The town also has a train connection and is part of a beautiful scenic trip between Nice and Dinge-les-Bains. It’s an interesting ride with an old fashioned locomotive through a very unique geographical landscape. Starting from the flatlands on the Mediterranean, the train slowly winds its way around breathtaking canyons clustered with ancient villages. Numerous castles and forts line the landscape, and it could be worth your while to stop at some of the stations if you fancy a bit of history. You’ll be just over 2 hours underway if you leave from the train station in Nice, and the ride is well worth the price (~€10 one way). 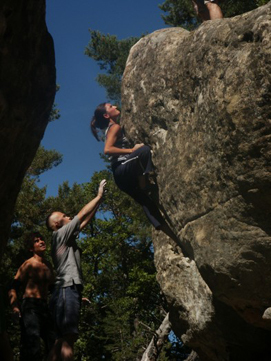 All of Annot’s boulders are located on the mountain of Argenton, which just 2 km north of the town in the direction of Fugeret. A small gravel road winds its way up the mountainside, and it is along this track that the sandstone boulders can be found. Boulder areas are divided into sectors with funky names like Dragon Ball and Scary Movie, each containing upwards of 50+ problems. There are over 20 of these sectors, tallying over 1000 boulder problems in total. When walking around the forest areas you’ll spot a ton of boulders covered in moss, so there is still plenty of potential here (new problems are being opened daily). A car is highly advisable, and saves a lot of time getting up (and down) the steep mountain road, however walking can also get you to the areas. The topograph for this area is free and can be found on the website abloc.org. Conditions are best during spring and autumn, but even in summer you can find plenty of areas covered in shade. The region however is prone to precipitation, and rainfall during the aforementioned seasons is not uncommon. The actual boulders themselves are in great condition with hardly any polish, providing amazingly sharp grip. So there’s no excuse for not making those tough problems. Let’s hope people keep it this way, too. The difficulty covers the whole climbing spectrum. From balance intensive, to strong overhanging routes, there’s a lot to do. However, this area is definitely more oriented towards powerful, athletic climbing and doesn’t have too many slabs like Font. You’ll find plenty of the routes have slopers, especially when topping out, which makes for some risky situations. You will need those crash pads, as some routes do get quite high. Spotting is also very important; the terrain is often hilly making for uneven landings. Make sure to keep in mind that our fingers can only take so much before they go bust, and this happens very fast! The rock just cuts through your skin, even though you won’t notice in the heat of things. A lot of sloper holds will also leave your palms in bad shape, so be sure to plan in some breaks. 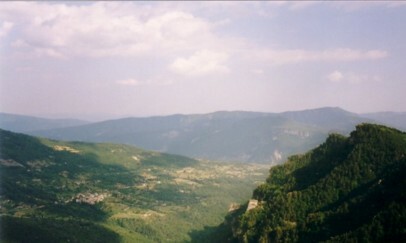 Annot has of late become a popular destination for climbers. This means you’ll meet a lot of them during the summer months. That said there is definitely a lot less commotion than in Fontainebleau and it is more peaceful. If you’re lucking enough to stay over the weekend, you might just catch a glimpse of some of the strong locals doing their projects. Famous people at that, well known in the French bouldering and climbing scene. It’s a very social scene, so don’t be surprised if you get people giving you tips or cheering you on during your climbs. Making friends is a good way to learn some new techniques and get the beta you need for that first send or quick flash. 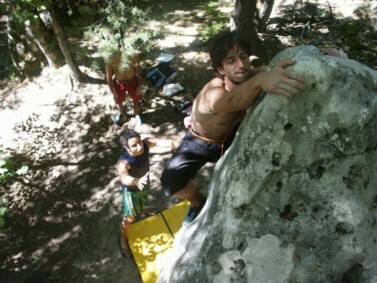 So is this really the next Fontainebleau, the avant-garde of bouldering in Europe? As with most questions, the answer isn’t clear cut. I really appreciate the quality of the problems here, and the way the local community takes care of the sectors. There are no marks of resin or poff, which is something that greatly irritates me about Font. The location is also stunningly beautiful and very tranquil. You’ll be bouldering in the cool breeze of the shady forest or on exposed plateaus overlooking an impressive valley. There’s no denying that this place has a good vibe, and it never gets crowded or hectic. During my three visits, I was often bouldering alone in the sectors. On the down-side, the problems aren’t nearly as varied as in Font, and a number of sectors are hard to find, with many problems covered in moss from lack of usage. If you’re willing to take these negatives into account, you’ll find an area teeming with adventure, and a destination that will provide you with a memorable holiday experience. There are two local campsites. One can be found just on the outskirts of Annot near the Ecomarche (supermarket). You will have to make the trip up the mountain every time you want to boulder though, but then again its closeness to the town makes it ideal for break days. The other campsite is a large farm half way up the mountain, and costs €2 per night per person, and an extra €2 for each tent. It has two toilets and two showers, just be sure to turn on the gas for warm water! It can get quite full, usually on the weekends, but there is still plenty of space. The patrons also offer dinner, if you’re looking to try some of their local cooking and regional wine. There are also local inns in the village, but these are often closed during off-season, so it would be wise to call first. It should be noted that one can visit this area without a car. It takes around 1-2 hours to get from Annot to the farm, and about one hour to get down by foot. That said, it is quite a walk, so be sure to have comfy shoes. I have done this and it does work. It is a little tricky with supplies since you need to log up supplies from the supermarket. However, it works and is another bonus to this already great climbing location. Also, if you want to camp near the town, you could easily spend a weekend just doing the lower circuits like Dragon Ball. This way you can avoid having to march up the mountain every day. All of the sectors are on private property and the locals don’t want you camping somewhere in the bush, or destroying the wilderness. Some areas have already been closed off due to rowdy visitors. Do everyone a favour and clean up before you leave.